A taxi burst into flames in Midtown on Monday, sending bystanders fleeing in panic. Melissa Russo reports. 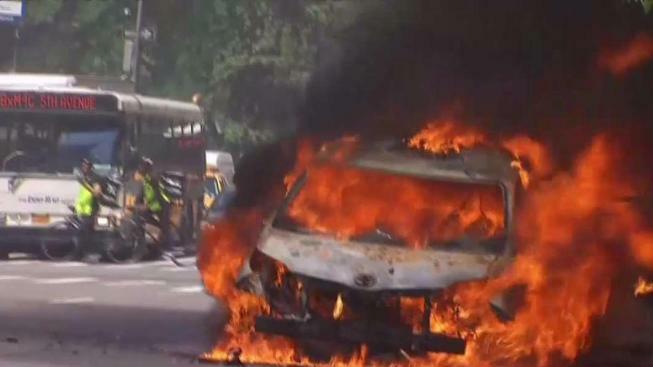 A taxi overheated and burst into flames in the heart of Manhattan Monday as temps soared past 90 degrees for the second straight day, authorities say. No one was hurt when the cab combusted on Fifth Avenue near 39th Street around 1:30 p.m.
Two passengers were in the cab when smoke started rising from the hood, sources told News 4 New York. The driver pulled onto Fifth Avenue and asked the passengers to leave. That's when one of them noticed flames above one of the front wheels and the driver and passengers left the cab, the sources said. Dramatic photo and videos from the scene show giant orange flames leaping from the charred wreckage of the cab, which appears to be parked right next to the sidewalk. Cops and other emergency personnel are seen on phones calling for assistance as they frantically try to wave bystanders away. The blaze appeared contained within an hour, and witnesses praised the FDNY's quick response in a flurry of tweets.